As I walked along our deserted country road this warm summer evening, holding my five-year-old’s hand, my mind wandered back through time. 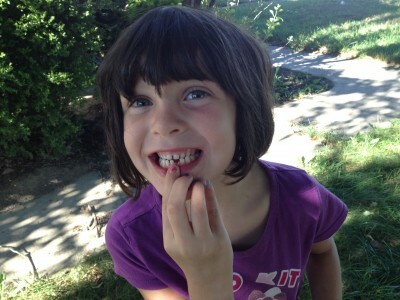 Last week she lost her first tooth. This afternoon she told me how she got to cross the road all by herself to get the mail, looking both ways to make sure no cars were coming of course. And in less than two weeks, she’ll start kindergarten. My eyes water already at just the thought of watching her climb aboard the big yellow bus and disappear out of sight. I only have to close my eyes and I feel her tiny fingers wrapped around one of mine, her soft cheek pressed against my breast. I can hear the little sighs and gurgles she made as slept in my arms. I can smell the sweet pea shampoo in her freshly washed hair. I can see her little legs carry her across the living room, one shaking step at a time to reach my outstretched arms. I try to wrap my mind around that elusive concept of time. Some days the seconds drag by in excruciating slowness. Yet in this moment it feels as if the years raced past me. Some days I wish I could pull a brake and slow time down and other days I want that fast forward button to take me some unknown place in the future that has to be better than the now. Some days I greedily wish for more time and other days I wish it away. Time…60 seconds in a minute, 60 minutes in an hour, 24 hours in day, 7 days in a week, 356 days in a year…The math adds up the same every time, yet in my mind I still struggle and wonder how that can be. Previous Previous post: Walking On Sunshine….Oh Yeah!